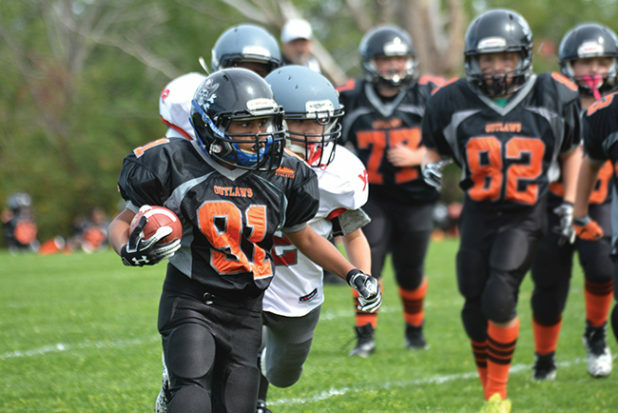 The Orangeville Outlaws peewee team are giving a solid effort and playing well during the fall football season, but they are still looking for their first win of the season. The Outlaws hosted the York Lions on Saturday, September 8, on the field at Westside secondary school. It was their third game of the fall schedule. The Lions scored the only point in the first half getting a TD and following up with a one-point convert. The O-ville defence worked hard keeping the York team from scoring with good hits on the field from Matteo Ciulla, Brady Harrison, Messiah Gordon, and Jackson Sparks. The Lion widened the lead to 13 in the second half when they made it to the five yard line then scored from the one. Orangeville’s Noah Jacques had a solid run in the quarter to bring the Outlaws down field but they couldn’t capitalize on the effort. The York team scored two more TD’s to take a 25-0 lead. It wasn’t until late in the game that the Outlaws managed to get on the scoreboard when Aidan Prieur brought the ball to the ten yard line then followed up with a TD on the next play. The O-ville defence again stepped up late in the game with a wall that shut down the attack. Defensive players, Joshua Pereira, and Henry Downey, were responsible for some good stops. With just 11 seconds remaining in the game, the Outlaws dropped the ball on the two yard line. Zackery DiPinto took the hand off and crossed the goal and a fast sprint to the right. Steven Ainsco got the two points on a successful convert. The game ended with a 25-14 win for the Lions. The Outlaws will have another home game this Sunday, September 16, when they host Hamilton at Westside.